In this post we explained how to use Google Analytics‘ UTM parameters for tracking. Another important feature in Google Analytics is „E-commerce Tracking “. In what follows we want to take a closer look at e-commerce tracking discussing likely problems and solutions. E-Commerce Tracking means gathering information about purchase activities on a website and sending them to Google Analytics. This is information about products, transactions, order value, time, order ID and other data. For this it is necessary to implement a tracking code into the website code. When the website is loading this tracking code creates a transparent pixel (also called tag) that sends data to Google Analytics. Why is E-Commerce Tracking important? Imagine that a potential customer found her way to our online shop. You spent €30 marketing budget in campaign XYZ on Google Adwords for her. As you are using UTM parameters you know that she found our shop through that specific campaign XYZ. Now the customer buys products for €220 gross. By means of e-commerce tracking you can gather relevant data of the purchase, especially the order value and the order ID. In Google Analytics you can look up the marketing costs (coming from Google Adwords) and gross sales of this purchase. As a result you calculate a customer value of €190 (€220-€30). Your Magento shop system also recorded the €220 purchase but then had to accept a cancellation of the most expensive product in the shopping cart. In the end, the customers net order value was only €20. We assume that the shop system is connected with the ERP system which has information about the material purchase value. In our example let’s assume it is €5 (your cost to purchase the teddybear from your supplier), which means that our customer value shrinks to only €15. [customer value Magento €15] – [marketing costs Google Analytics €30] = [customer value €-15]. 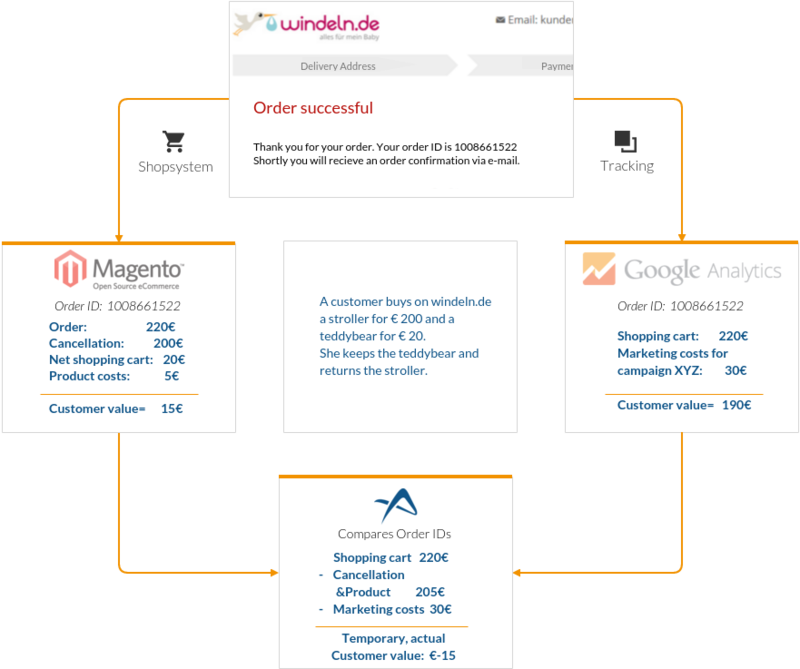 This clearly shows that e-commerce tracking is highly relevant in order to connect marketing information of an order with the net order value and the contribution margin of this order! Applicata compares order IDs and merges all data. If the customer returns and buys more products in this shop, Applicata determines automatically the new customer value. How to set up E-Commerce Tracking? 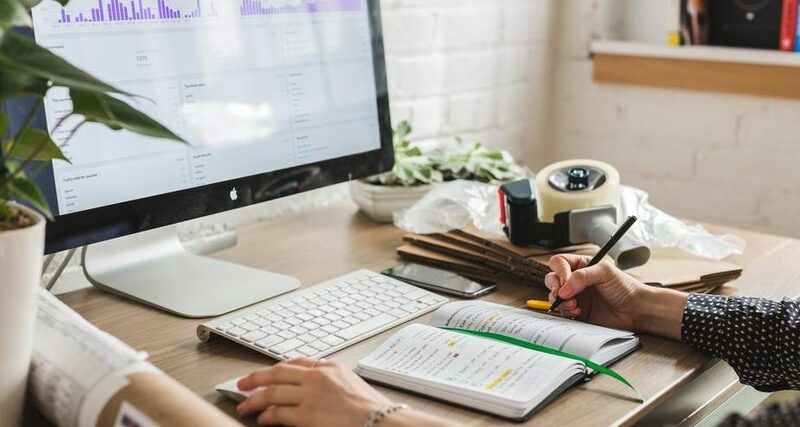 To integrate e-commerce data in your Google Analytics reports, e-commerce has to be enabled for each view in which you want to see the data.The Google Support provides detailed information on e-commerce set up. In case there are lots of tags (find supported tags here) to handle that send information to a third party, it is recommended to use the Google Tag Manager. This is a single container tag that also needs to be implemented on each site, but once it’s done every other tag can be added and configured via a user interface. No further coding knowledge is needed. What is the Problem with E-Commerce Tracking? In Applicata’s experience companies using E-Commerce Tracking often do not track more than 20% of their transactions correctly. This means that they cannot determine revenue, customer acquisition costs and costs/revenue ratio for more than 20% of their orders. What follows demonstrates several problems concerning e-commerce tracking we often see and solve in Applicata projects. If the pixel is not triggered while the website is loading, it cannot send any data to Google Analytics. In this case you should set up test orders in different browsers and from different devices. This is how you can identify which combination of browser and device blocks the tracking. Mostly the reason is found on your own website and you should call in a developer. If a customer decides to buy a product and chooses PayPal for payment he or she will be directed to PayPal. The payment is executed externally at PayPals website. As soon as the payment is finished, the customer should be redirected to the shop automatically. There he or she should be led to the confirmation page with the order ID. The confirmation page is very important because this is the place where the tracking pixel fires and sends the order data to Google Analytics. In many cases PayPal is not implemented correctly and the so called ‘Auto Return‘ to the shop website is not triggering the pixel. It can also happen that the customer closes the PayPal page after payment and a redirect to the confirmation page is no longer possible. Very often we notice that the utm_source parameter is overwritten during auto return. In this case Google Analytics takes PayPal for the referrer although the actual origin is different. In this case the information how the customer came to your website would be lost for everyone who paid with PayPal. In case you are using Googles Universal Analytics you do not have to add ?utm_nooverride=1. You simply add paypal.com to your ‘Referral Exclusion List’. The same applies to all other online payments systems. All websites that receive user data should have a save HTTPS (Hyper Text Transfer Protocol Secure) connection. No matter if it is an online shop or online banking. Other than a HTTP connection HTTPS transfers encrypted data to the server. There can be a problem when only some parts of the website are encrypted and others, pictures for example, are not. This can cause the tag not to fire and thereby not to send e-commerce data to Google Analytics. To be completely sure that incorrect tracking is not caused by an insufficient encryption you should always encrypt the whole ordering process. Encrypting the whole website is even better. Some companies are not using a shop system like Magento or Demandware. They build their own proprietary an online shop. In these cases, we often recognize that the websites are loading far too long. The problem is that slow loading pages can prevent the tracking pixel from firing and consequently no data will be sent to Google Analytics. The tracking code snippets that create the pixels are placed in the website’s source code one after the other. While loading the website the code is read from top to bottom including the tracking code. If there is a buggy snippet of, for example, an affiliate system it prevents the following snippets from being read. The website loading is interrupted at this point. So, if the Google tag is located after the buggy code it cannot be read and executed anymore. In this case no e-commerce data will be sent to Google Analytics as well. It is preferable to use the Google Tag Manager. Wrong configuration can be a problem. Common problems with firing tags from Google Tag Manager have already been described here. To evaluate the efficiency of marketing efforts Google Analytics is a very helpful tool. Correct set up of e-commerce tracking is a basic requirement to ensure a clean connection of marketing and order data. Through systematic elimination of every possible source of error we achieved over 98% e-commerce tracking rates with our customers that started with a 70% rate. This means that about 30% of their orders were not tracked correctly until the problens were solved as part of the Applicata BI Implementation project. ← Business Intelligence vs. Google Analytics – Why is a business intelligence solution indispensable for companies?